This is a massive collection of Art, including Graphics, Configured Tilesets, Characters, Music, and sixty five 100% Compatible Scripts in a giant Demo that tries to teach you how to use every single one of the Scripts! There is not very much this package can not do! There are far too many features to display in a single screenshot, so this is just the most recently updated stuff of the Caterpillar boarding a Boat Vehicle! This is HALF GAME, and HALF TECH DEMO. NPC Characters explain everything! Each script will have its own instructions. Grab the Demo. There are likely to be some conflicts, but all of these scripts work together with 100% compatability. NOTE: If you have trouble opening the Demo from the Editor, you can change the version by editing Game.ini Library=RGSS102E.dll or what ever you need to suit your version of RPG Maker. You can also edit Game.rxproj with Notepad and change RPGXP 1.02 to suit your version of RPG Maker. I'd like to thank Everyone whose content I used with their permission. I tried to list everybody whose content was used. If I used your content without your permission, please let me know and I will remove it! It's amazing! Any time there's a script I need some help with, I always come to this thing for a good reference. Saved me a ton of time searching ._. Thanks dood, great work! Ive been more active on CP, but neither place is very active. One of the users over there requested a feature and found some mapping bugs (not much of a suprise there, Im sure they exist), so I'll have to update in the next few days. That's the best Compilation's of scripts demo i ever seen. It's really well explained and interesting. All the stuff about game design and mechanism are also very nice. Thanks! Just updated and added a few minor bugfixes and some new features, including a very simple Animated Battlers! (or i don't find the NPC who talk about that, i saw there are a "Menu System (Naramura)" folder in the Graphics. Menus are something I have definitely thought about. I just played thru Final Fantasy X and was thinking about the Menu Options during that game. They have some very good ideas in there, like being able to change equipment during combat and a scrolling list of Main Menu options. And there were some things I didnt really like either. Later in the game, your list of Menu Options tends to get really really long. Attack, Skill, White Magic, Black Magic, Item, then you end up having to scroll really far to get where you want. So there is more I want to do based on what makes those features add more frustration than satisfaction during gameplay. I'd definitely need to build a full Option Scene, again, based on Final Fantasy with Cursor Memory customizable by the Player. But if that is the only option, it needs more. Battle Speed and Active Wait option would most likely need to be added. Thus, result is a lot of work, and just for better menus, which would definitely be a plus. The Battle System is basically "stuck" in a "Wait" mode, but I would like to change it around to allow for "Active", where an enemy can attack you and CP Bars still fill while the Main Menu is active, but Sub Menus like Select Spell or Item would pause the CP Bar. The ability to do it fast makes gameplay faster and much more dynamic, however, menus themselves would need to be perfectly organized. Other games Im fond of are the old 16 bit Phantasy Star games. The second game is too different to consider borrowing style ideas, but some of the functionality of the fourth installment I think would be cool, like Combining Spells, or Macros. I think I have seen a spell for combining spells somewhere, not sure about how to implement a Macro. Honestly, I expected people to show more interest in the Battle System, but I think RMXP is dying off at such a rate that it hasnt really gotten enough peoples attention. I did expect some Add On scripts for it as well, but suspect that will probably be on me to write and create. So still on the topic of Menus, do you have any specific ideas for improving them? The Naramura Menus should have just been Windowskins if I recall correctly, so there isnt really an NPC for that as it isnt really a feature. First, sorry for my bad english, i'm french And i'm not a scripter. A key of this system is the speed of battle actions. The player and the enemies have an interest to act more often and to slow down their opponents. There are skills, spells and objects which can do something about the speed. The speed of the actions is important also. Take an object for the bag takes 75% of the CP bar, so if I want to act quick, maybe using an object instead using a spell is a better solution, etc. To improve that, maybe add some spells or actions who takes a long time to be cast or used. A summoning spell will take 100% of a CP Bar (first part of the spell) AND activate automatically a second action (the second part of the spell) for 100% of the CP bar to effectively summon the monster. Maybe that can be done with a Combining Spell script, as you mentioned it. After that, we have the zombie state and the reflect spell which is very cool indeed. An another improvement maybe can be a way to play with the choice of the target for the enemy. Enemy can target the weakest character and, a warrior can taunt for aggro the enemy's attacks on him. Your english is pretty good. Dont worry too much as I clearly understood what you were communicating. I think that Scripts themselves need to add and enhance functionality of an existing engine. That is one of the reasons I tried to allow as much as possible to be done from the Editor. Messing with Script Config is harder than clicking on stuff in a User Interface. I tested out some of the State ideas, such as lowering and increasing Speed (agility), since the Battle Script is based heavily around that. I do agree that different costs for different spells is a good idea, so I'll look into how to add that in. Some of the stuff I did not do was to create many many States for weapons and armors. I just tested a Sword that could inflict a State on an enemy, and it is already built in. Player equips that sword and attacks an enemy that has a bad State Efficiency, and the sword inflicted that State on the Enemy. Enemies can also have Specialized Attacks that can also inflict States on the Actors. Being able to Inflict States on either Actors or Enemies does exactly what you said and alter States so that Agility is affected while those States are Inflicted. But most of this seems to be Database work, not Script work. I enjoy providing examples of how to accomplish specific goals in this Collection, but I also try to leave most things open so people can customize their game to their liking, based on examples I provide. The "Lead Armor" I used "Auto State" to show that it was tough, but made it obvious that it slows the player down. The "Auto State" is not needed to slow down who wears that armor, but it isnt that obvious to the player. Its mostly a Database Example. This is mostly Database Work and depends on how someone that uses RMXP in general wants to set up their game. Some designers are lazy and just use default stuff. Others dig in deep and really enhance everything. I would figure that the best weapons and armor in any game would be light enough to not burden the Actor, so they would be very light but also very very strong. Thus, Lead Armor can provide an Agility Penalty, while other Super Armor would actually increase Agility. In the Armors Tab, the changes to Str, Dex, and Agi affect the Base Str, Base Dex, and Base Agi. The way the script is written is to change the color of the CP Bar if an Actors Base Stats differ from Stats after States are applied. Thus, changing Agi with Armor wont make the CP Bar change color, but an Armor that gives an "Auto State" of Haste will cause the CP Bar to change color. There are some things about the Editor that are not clearly understood by everyone, yet, are fully available. I tried to write my scripts to add to the current functionality, so those features still exist, but are sometimes forgotten about. I'll try to explain what the current editor can do without Script addons. An actors Weapons can inflict States on Enemies. An actors Armor can protect against States from Enemy Attacks or Spells. An actors Armor also has "Auto State" when that Armor is equipped. These features already exist in the Database Editor, but next version I'll try to include some examples of State Inflicting Weapons so it is better understood by all how to do these without Scripts. I'll also put together an Add On for customizing Skill Costs for each Skill, which is something that cant be done from the Database Editor. Im also working on a way to use VX Ace Backgrounds in XP with lots of additions, a fully "Active" Battle Mode, Battle Menu Enhancements (change equipment during battle), better Animated Battlers, and other additional added functionality. Any requests for just about anything in the package is welcome by anyone. Heretic's Collection just got upgraded to Version 2.0, and this is a MAJOR UPDATE! The total number of scripts is now at approximately 65! The UPDATE includes FIFTEEN NEW SCRIPTS including VEHICLES! There are so many new features that it would probably not fit within 10 posts! That is how much stuff has been upgraded and still remain 100% compatible! The core of the New Scripts is called "Modular Passable", which basically allows for more VX/A style code where simple alterations can be made. This is what allowed me to write another script called Restrict Tile Passages, which allowed for VEHICLES! Yes, the Player can move about on Water Tiles now! Actually, EVERY Event can, and YOU have FULL CONTROL over where everybody can and can not move! Also contains new code for Looping Maps, Mirror Movement, Downhill Ice, Diagonal Stairs, NPCs on Event Tiles, Hotfoot Tiles, Circular Sprite Motion, Rotate Zoom and Pendulums, and a Collision Optimizer! Oh, and even a Magic Compass! You can now use VX Ace Backgrounds in XP Battle Systems! You can Disable Battle Commands! Map improvements such as Heretic's Lightning (for Thunderstorms). I've literally lost track of how many new features I have added! It is really worth your time to check out, even if you have checked this package out before! New version includes Transitions Pack by ThallionDarkshine. Added a brief demo for the script. I also updated the Transitions Pack script to fix a couple minor bugs and added a couple of options for enabling and disabling Transitions during gameplay. No other changes to the rest of the scripts have been made. I check time to time and i'm amazed you have continued and improved all the stuff. I'm only worried about performance, the rpgmaker XP engine is not a tought one. Wow Heretic, this is really cool. I'd like to do more but just dont have as much free time as I used to. Trust me, more is planned. Now, for performance, believe me, more advances can be made, more scripts added, and framerates can actually increase! As an example, one of the packaged scripts is called "Collision Optimizer". Normally, every Event gets updated once per frame. Now lets say you have five Events on the map. When each of those Events tries to move, it scans every Event to check for a collision, thus 5 Events scanning for 5 Events results in 25 total checks. Five events isnt a big deal and shouldnt cause anyone issues as far as performance, but when dealing with high number of Events, because ALL Events are checked, that is one place that performance hits take place. So now lets say instead of just 5 Events, you have 250 Events. Each frame, each Event moves, thus checks ALL Events. As a result, for 250 Events moving, 250 Events are checked for each moving Event, thus, 250 x 250 = 62,500 and that is one place the Framerate really starts to suffer. The "Collision Optimizer" works like this: when an Event is updated, it checks its position against a Hash, and updates it when it is different. But for checking for Collisions, the Hash allows the moving Event to check Events ONLY at a specific map location. For example, $game_map.events tries to move to X=51, Y=39, the Hash is used to grab Events at that spot. If there are no Events there, then ZERO Events are checked for collisions. If one is there, then one Event is checked. If two Events are at 51, 39, then ONLY those Events are checked. This reduced the number of checks for 250 Events on a Map from 62,500 to less than 250 because not Every event is moving or colliding or next to another Event. This speeded things up a LOT. Now lets bump up the number even higher. Lets say 5000 events. Cant be done without scripts. Without the Collision Optimizer, 5000 x 5000 = 25,000,000. 25 MILLION checks per frame. That destroys framerates and turns games into slideshows. With the CO, only the Events that are moving to a new set of logical coordinates are checked for collisions, thus, number of events scanned drops from 25,000,000 to well less than 5000. As a result, further performance increases ARE possible, as well as adding more functionality and even more scripts. There are two more major roadblocks that take a toll on performance. Graphics are the #1 framerate killer. In XP, we dont have access to the core graphics renderer, but can make some adjustments to the module Graphics. If collisions were written inefficiently, you can also imagine that the Graphics module was also written rather inefficiently also. Last on the list is Ruby itself. Version 1.8.7, which is what XP uses is slow in comparison to newer flavors of Ruby. Fortunately, we can use this to our advantage. 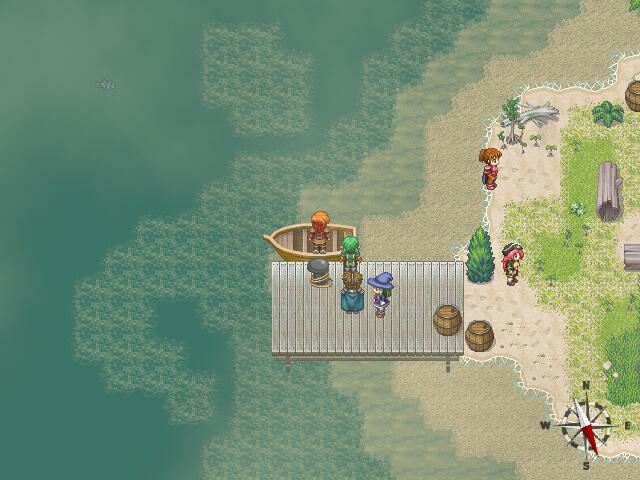 A couple of guys over on chaos-project have been working hard for some time on our own version of XP Ace, where we can use the speed and efficiency of both newer versions of RPG Maker and Ruby. We edit with the XP Editor, and the game runs using the VX Ace dll files. And there are some serious performance gains to be had there also, as well as drawbacks. I ran into trouble using our homebrew XP Ace with a couple of scripts. Cloud Altitude didnt like me very much on XPA, and Im pretty sure all the Transitions (lateset release) also dont work due to differences in the Graphics module. So there are ups and downs to our homebrew XP Ace solution. The last major update I put into the Collection came from rewriting just TWO core methods that handle collision checking. And it enabled Vehicles, Non Player Characters to move around on Event Tiles (like the player can), the Collision Optimizer, Looping Maps for XP, Diagonal Stairs, Ice, Restrict Bush Passage, and Restrict Tile Passage (core for Vehicles). That was the "Modular Passable" script. Its kind of like the SDK for just 'Game_Map passable?' and 'Game_Character passable?' methods. What I wanted to do there was to do it better than the SDK by only releasing ONE version of it, so it had to be absolutely perfect upon release. That was what really killed the SDK for XP was so many versions, and what I did my best to avoid at all costs. Trust me, that was a LOT of work. It doesnt look like much but it took me months to fine tune and perfect Modular Passable. I believe the payoff was well worth the effort since I can continue to write even more scripts, efficiently, that are 100% compatible with the rest of the Modular Passable scripts. I did take it a bit further as I put in some extra code so we could also efficiently and easily add Comment configurations to Events with like two Aliases. That allows us all to write compatible scripts that dont have that dont impact performance that much. So if say M.A. wrote a script that prevents characters from moving on either Map Tiles or Events with a certain terrain tag, he'd put in a Comment that read something like "\no_move_terrain_tag[5,6]". When the Events are doing their thing, his Comment Config gets scanned with the rest of the Comment Config calls so his code shouldnt have to do its own set of scans. Then the new properties get added to Events in a more efficient manner. What else is good is the Comment Configs do NOT have to be the very top line on an Event's Page which preserves Compatability between scripts. What happens there is if someone writes a script that needs the top line of an Event Page to read one thing, and another script also needs to use the top line of an Event Page, then we, as users, would not be able to add features of both scripts to that Event. Its usually one or the other, and again, Modular Passable takes care of that. Comment Configs can take as many lines as they need to, in case a Config needs one or more Comments to configure. Such as Sound Emitters and Super Event Sensor. In the end, we can still use the XP engine without adverse effects on performance if we write our scripts properly. Im glad you guys appreciate all the work I put into this thing. Remember tho, Im always looking to expand it even further, with even more Scripts, Art, Tilesets, Characters, and Music, and I will continue to update this beast when time is available to me.